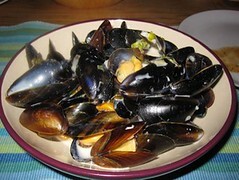 Throw the mussels quite brutally into the sink – that way the ones which have started to open will promptly close. Try to pick clean mussels but if needs be, scrub them with a small vegetable knife, to get rid of the barnacles. You can use the knife to pull off beards as well, or just use your fingers. The same approach works for clams, only they don't need much scrubbing. 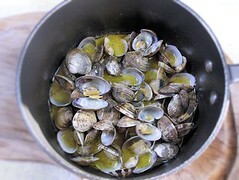 Mussels or clams will keep overnight in a bowl in the fridge, covered with a damp paper towel.